Minimalistic web design has been all the rage due to a simple reason—loading speed. It turns out that how quickly a website loads is indeed a major factor in a lot of things, including the overall user experience and even search engine optimization. It all boils down to one simple fact—fast load times are always better. Therefore, it's imperative that you put the squeeze on your website and make it load much faster, especially in this mobile-obsessed world. 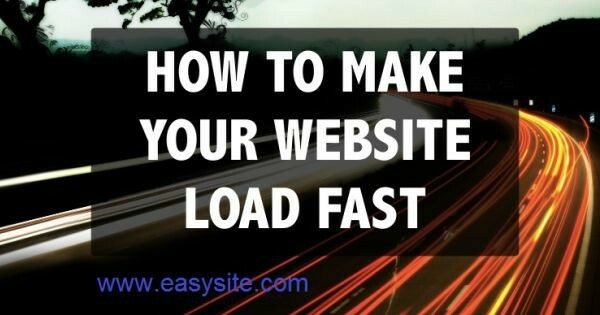 If you're clueless about what you can do to make your website load much faster, here are some of the big things you can do to make it a whole lot faster. Remember that every little bit of speed counts. Sometimes less is best. A very good way to make your website load faster is to simply cut away the non-essentials in your code. The more code there is on a page, the longer it takes to load, so you have to make sure to keep cleaning your code up on a regular basis. The website building software we use on Easysite is optimized to load fast. This means that when you create a website using Easysite you are starting with a super quick loading web page. We care about your page speed and will never have heavy scripts and codes that will slow your page load time down on our website builder. This means that when you build a website using Easysite you know you are starting with a fast loading page helping your site load faster for your visitors and rank higher in those search results. This is certainly one of the biggest web development topics in recent years. Flash has had a good run, from its early days in the late 90s and early 2000s to the tail end of its life when it became too slow and sluggish to deal with and HTML5 popped up as a better alternative. YouTube had since fully switched to HTML5, and many other websites are following suit. You should too since it's not really necessary these days. More and more people are now turning off Flash in their web browsers to free up memory and improve performance. You may have ads and other widgets that require Flash, and that's understandable. But you should at least see if there are non-Flash alternatives that you can take to speed up your website. It's surprising just how much images can add to a web page's loading time. It may seem tedious, but since images can add up and occupy tons of space very quickly, you better be consistently optimizing your images that you're about to post on the website. Optimizing means getting the most compression possible without compromising the image's visual quality. Whether you use an image optimization program for this or just save images in a format setting that best balances quality with a small file size, just make sure that the images you're uploading aren't too bloated for what they're good for. If you don't really need that image at a blown-up HD resolution with super clear quality, then make it smaller and compress it. This seems like common sense, but you'd be surprised just how many people out there put too much stuff into a website right from the get go. Just keep in mind that it's easier to add more stuff as you go along than to remove stuff from a website when you've already had it up for a period of time. Stick with a simplistic design at first, putting only the features your website really needs, and then gradually working in more features when necessary. Something this simple can go a long way and prevent tons of problems down the line. There are a lot more things you can do to speed up your website, including transferring to a much faster web hosting provider and so on. Whether you're willing to do something that drastic or not, you can keep working on making your website faster and get some positive results. If you happen to have your own ideas on how to speed up a website or read any articles that you have found to be helpful please send us a email. We would love to hear what you think about this, and thank you very much for reading this article.